I love working with puff pastry and though you can make it from scratch store bought is inexpensive and the quality is wonderful. It is so easy to work with and the finished product is always beautiful flakey and tender. 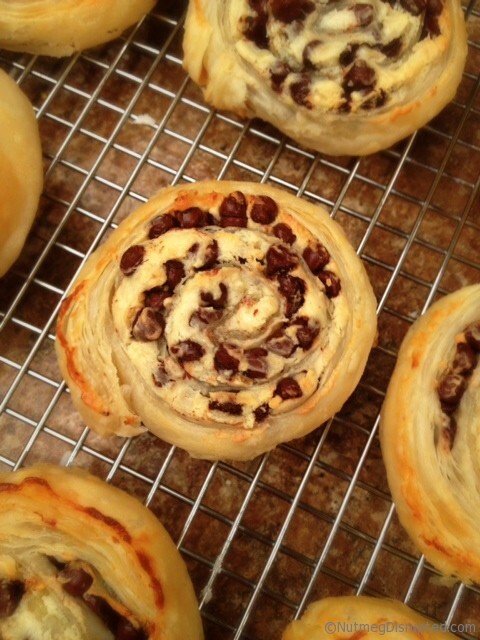 I have used it before for sausage rolls and Maple Pecan Danish and thought it could make a fabulous fancy cookie! These delicate cookies are always an fancy addition to my cookie trays. If you prefer darker chocolate, use semisweet chocolate chips in this recipe. 17-oz. pkg. frozen puff pastry – thawed 8-oz. pkg. Make sure that you thaw the pastry according to package directions. In small bowl, combine softened cream cheese and sugar and mix well to blend. Roll one sheet of the thawed puff pastry into a 14×10″ rectangle. Spread with half of the cream cheese mixture, leaving a 1″ border on one long side of the dough. Sprinkle cream cheese filling with half of the chocolate chips. Roll up pastry, starting at long side, and finishing at the side with the uncovered border of pastry. Brush this edge with a bit of water, and seal pastry by pinching gently. Repeat with remaining sheet of pastry and remaining ingredients. Cover and chill rolls for at least 1 hour. When ready to bake, preheat oven to 375 degrees. Line cookie sheets with foil or parchment paper. Cut rolls into 1″ thick slices, and place cut side up on prepared cookie sheets. Bake at 375 degrees for 20-25 minutes until pastry is golden brown. Let cookies cool for 2 minutes on cookie sheets, than remove to wire racks to finish cooling. 24 cookies. 17-oz. pkg. frozen puff pastry - thawed 8-oz. pkg. Thaw the pastry according to package directions. In small bowl, combine softened cream cheese and sugar and mix well to blend. Roll one sheet of the thawed puff pastry into a 14x10" rectangle. Repeat with remaining sheet of pastry and remaining ingredients. Cover and chill rolls for at least 1 hour. Line cookie sheets with foil or parchment paper. Cut rolls into 1" thick slices, and place cut side up on prepared cookie sheets. Bake at 375 degrees for 20-25 minutes until pastry is golden brown. Let cookies cool for 2 minutes on cookie sheets, then remove to wire racks to finish cooling. 24 cookies. So sorry for your loss. I hope you can find peace with those words left on said… Writing about it, sending it out into the universe always helps me when I’m struggling with something and I hope it will do the same for you. Thanks for your kind words. It is hard to believe it will be a month tomorrow. I agree, it is never easy. I am just trying to focus on the good memories. Loving the new job and it totally came at the right time. Love when that happens. Maple is a great addition to the cream cheese! Syrup or flavoring both work. I agree, if it were not for store bought puff pastry it would not happen in my kitchen too often. It is quite labor intensive making from scratch. Yikes, and how did I forget to say the following words: I’m very sorry for the loss of your grandmother. I only have one grandparent left. One I never met, one suffered for a long time before she passed, and the other left rather suddenly. No matter how they go, it’s always difficult and you never feel like you had the chance to properly say goodbye. I know it’s tough but I’m glad you have your new job as a distraction. Hang in there! I love simple, easy recipes like this that create such an indulgent, decadent treat. Thank God for the invention of frozen puff pastry. I made something similar at Christmas with Pilsbury crescent dough – one version with Nutella, another with peanut butter and chocolate chips. Cream cheese would taste awesome! I think I love them so much because they are so easy and decadent. Not your average cookie! These look very easy to make and very decadent, would love to try these over the weekend.